Remember when you first decided to learn to scuba dive? I do! I wanted to stay underwater a little longer than I could simply by holding my breath. I learned to scuba in 1979 and those first dives were seldom deeper than 33 feet (10m) deep. My tank had a valve release that you pulled to get the last remnants of air (50 bar/725psi) once it got too hard to breathe on. There was no SPG. I had to get my weights right too, because there was no BCD to help me. Apart from mask and fins, there was precious little other equipment. I’m sure that many older Undercurrent readers started the same way. But then I wanted to go just a bit deeper and so started a journey through diving certifications and techniques. I reflected on this some years later when I made a dive using trimix to a depth of 390 feet (120m) with technical diving pioneer Rob Palmer at Ras Umm Sid in Egypt’s Sinai. It was surreal. During the best part of the dive, we had a manta ray swim round us in the gloom. It was the same manta ray that swam around us as we waited out the long decompression time required on the trapeze hanging from the boat, in the shallows less than 33 feet (10m) deep, later. As a diving journalist, it was my job to experience every sort of diving and often found myself at the forefront of developments. If I had been diving for leisure, I would probably have stayed with a single tank but rebreathers were an obvious next step. 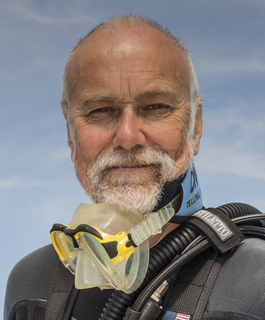 Cut to 25 years later and I listened to Martin Woodward, the owner of Britain’s busiest inland dive site, expressing the opinion that the popularity of rebreathers were making people give up diving. How can that be? It’s as if other divers need to reconfirm their buying decisions by persuading others to buy the same equipment. Before they know it, those people that merely wanted to stay down a bit longer than they could on a held breath are weighed down with both equipment and diving certifications. Woodward sees thousands of divers pass through his inland site, ‘Stony Cove’, every year. In the UK, it’s an obvious place to go to do a diving course or to practise with the latest equipment you’ve purchased. He says he first sees them as new divers, full of trepidation and with basic kit and then he sees them return again and again as they progress through layers of diving courses, until they eventually splash out all their money on a rebreather. Even at the beginner level, he’s constantly suggesting to manufacturers they should make a simple regulator that has no knobs to allow the user to adjust them incorrectly. He says most people need a regulator that simply allows them to breathe underwater and that never free-flows. (Stony Cove is full of very cold fresh water that can be a test of any regulator.) Most people want simplicity. I work in a busy London dive store at the weekend. It never ceases to amaze me that people who have not even embarked on a diving course, come in with lists of equipment suggested by diving friends, much of which it totally unsuited to a new diver. It’s too easy to set a technical diving computer to an inappropriate gas mix or use a wing-style BC that tips forward an anxious new diver while floating, waiting to be picked up at the surface. Keep it simple. Don’t put off new divers by making it more complicated than it needs to be. The more advanced equipment will always be available for those who really need it. It is not only in diving. A symple bicycle that is much older than scuba can be bought with hydrolic disk brakes and electronic gear shifting (that fails if you forget to charge the battery).